In global comparisons, South Africa meets the average amount of government expenditure allocated to services like education, health, and housing by similar middle-income countries. Yet there is growing frustration with the type, quantity, and quality of services received by the country’s poor. Improve the provision and dissemination of budget and service delivery information. Improve the quality of civil society engagement with government at the point of service delivery. Support the formation of pro-accountability coalitions. Support the replication of our civil society partners’ campaigns. Social Audits — audits undertaken by communities on the delivery of services provided by the government — have grown and innovated all over South Africa in the last six years. The video tells the story of how social audits in South Africa have spread to more cities, how they have been scaled up, how collaborative relationships have been developed with government and the Auditor General, and how the methodology has been applied to infrastructure and the mining sector. 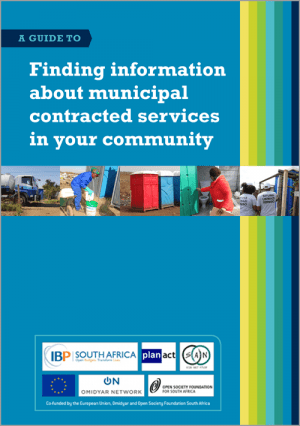 This guide is designed to help informal settlement communities in South Africa find the documents that provide information about a service being delivered to their community, which can be used to monitor if services are being delivered according to government contracts, and to engage with the government to improve the delivery of the service. The Social Justice Coalition (SJC) is a mass-based social movement based in the informal settlement of Khayelitsha in Cape Town, with a growing membership in other informal settlements across the city. Soon after it was formed in 2008, SJC heard reports from many residents that the lack of adequate toilet facilities resulted in people being assaulted, raped, and murdered when relieving themselves. There were also several other reported problems related to sanitation. SJC estimated that at least 500,000 residents of informal settlements in Cape Town did not have access to adequate sanitation. In response, SJC launched the Clean and Safe Sanitation Campaign in 2010, which aims to ensure that the city council properly maintains existing toilets and also provide additional clean and safe sanitation facilities in informal settlements. The Clean and Safe Sanitation Campaign is currently located in the SJC’s Local Government Programme, which is one of the two programmes within the SJC, the other being the Safety and Justice Programme focusing on policing. Formed as a voluntary association of professionals in 1985, Planact has evolved into a well-established non-government development organisation. Planact works with poor communities and informal settlement residents in a number of metropolitan and local municipalities across Gauteng and Mpumalanga provinces. On request from organized communities, Planact supports the development and strengthening of community-based organizations and provides capacity building, social facilitation, research, and advocacy support to promote participatory governance, integrated human settlements, and community economic development. Planact works extensively with communities on issues of access to basic services such as water, sanitation, and electricity but also supports communities to engage more meaningfully with processes and issues related to informal settlement upgrading and housing provision. This short video tells the story of how work done by Planact, the Social Audit Network, the International Budget Partnership South Africa, and the government of Ekurhuleni led to improved sanitation in Wattville and improved relationships between government and residents. In February 2016, Planact, with the support of the International Budget Partnership, Social Justice Coalition, and Ndifuna Ukwazi, partnered with the Spring Valley community on a social audit of water service delivery in the informal settlement, aimed at holding the Emalahleni Local Municipality accountable for water provision. This short video highlights their success. Click here to read more about the project and download Planact’s Social Audit Report. 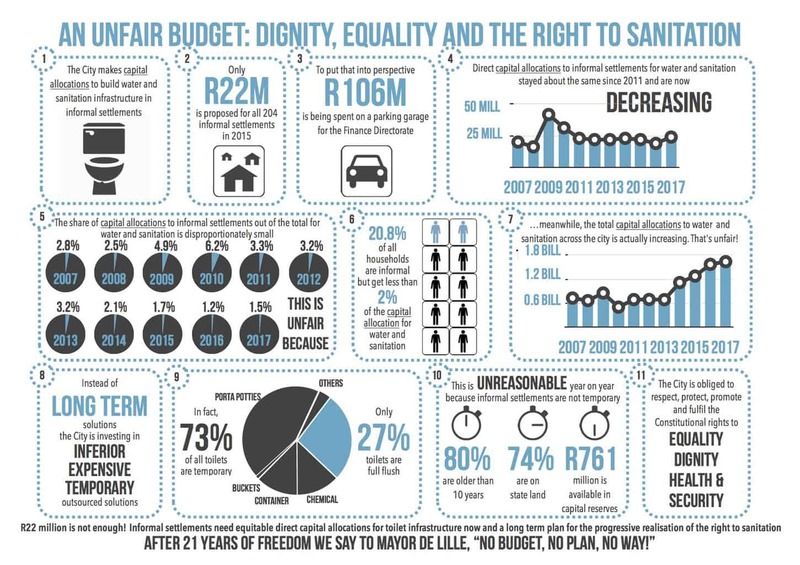 In 2015, the Social Justice Coalition started a campaign to challenge the City of Cape Town’s unfair budget and to make sure that the voices of those most in need are heard. This short film tells the story of the struggle for a fair, equal, and just budget. Read more about the campaign at the Open Budgets Blog. Mayor de Lille, here’s your evidence. It’s time for action. This paper provides a detailed overview of the minimum level of procurement information metropolitan municipalities should be publishing on their supply chain management websites to support public engagement in the monitoring of the delivery of outsourced services and engagement in the tender process. This research examines the findings of social audits, provider bid specifications, and interviews with municipal officials to identify the systemic causes of outsourced service delivery challenges and outlines several issues local governments could address to improve service delivery to informal settlements at scale. How transparent and participatory are the budgets of Metropolitan Municipalities in South Africa? While the national government has undergone regular budget transparency and participation assessments through the Open Budget Survey since 2006, to date there has not been a similar assessment of public finance management systems and practices for local and provincial governments. This paper introduces the International Budget Partnership South Africa’s Metro Open Budget Index, which will complete the public finance transparency and participation picture by assessing these practices in metropolitan municipalities. Access to Information: Finding the Right Municipal Official (September 2017): Access to information is one of the biggest challenges organizations that try to engage in the budgets of local governments in South Africa face. For a recent project, IBP South Africa, Planact, and the Social Audit Network used a networking approach to access the information they needed. This graphic explains how they did it. A Proposal for a Learner Transport Conditional Grant (September 2017): This paper presents two possible approaches to the design of a learner transport grant that will, over time, enable South African provinces to provide learner transport to all learners in need, and ensure that funding is protected for the delivery of this service. A Four-City Analysis of the Financing of Informal Settlements Upgrading (July 2017): Informal settlement upgrading is becoming an increasingly pressing policy priority in South Africa. The most recent census data indicates that about 63 percent of the population already lives in urban centers – a number estimated to increase to 70 percent by 2030. This brief describes how four South African metropolitan municipalities — Buffalo City, the City of Cape Town, the City of Ekurhuleni, and the City of Johannesburg — finance the upgrading of informal settlements. How Much Money is Allocated to Informal Settlement Upgrading in the City of Cape Town’s Draft Budget for 2017/2018? (April 2017): The most recent statistics from South Africa’s 2011 Census show that 20.5 percent of the City of Cape Town’s households live in informal housing. Efforts to upgrade informal settlements is the constitutional responsibility of local government. The analysis presented in this brief seeks to identify how much the City of Cape Town has allocated directly to informal settlement upgrading in its 2017/18 draft budget. In this op-ed for Ground Up, IBP South Africa’s Albert van Zyl addresses President Jacob Zuma’s March 2017 dismissal of Finance Minister Pravin Gordhan. A Guide to Local Government Budget Advocacy in South Africa (April 2017): Issue specific budget analysis can be a powerful tool to support advocacy campaigns to improve the quality and quantity of service delivery to poor people living in South Africa. This guide describes a step-by-step approach to reading and analyzing local government budgets with a focus on a specific service delivery issues. It also includes information on how civil society organizations might use their analysis findings to advocate for better service delivery. How are Upgrades to Informal Settlements Financed in Metropolitan Municipalities? (March 2017): This brief draws on a review of relevant policy and budget documents and interviews with experts to present information about the financing of informal settlement upgrading in metropolitan municipalities in South Africa. Understanding how this process works enables civil society and local residents to engage with all three levels of government on whether enough money has been set aside for informal settlement upgrading and whether metropolitan municipalities have used funding appropriately. Comments and Recommendations on Data Requests on Public Funding of Basic Education in South Africa (January 2017): IBP South Africa commissioned Cornerstone Economic Research to assess the availability of disaggregated budget data that responds CSO requests for information needed to monitor funding for and the delivery of basic education. The report provides responses to the specific information requests, indicating where information can be found (where publicly available) or who in government is likely to be able to provide the information. It also raises interesting questions around who CSOs should engage with when advocating for more detailed and relevant budget data. Processes for Financing Public Basic Education in South Africa (January 2017): Learn more about how basic education is funded through national and provincial budget processes in South Africa. Children and South Africa’s Health Budget (October 2016): This brief looks at health budgets. It first presents and describes a set of key indicators. It then describes the structure of provincial budgets and, in particular, how one can identify funding for children’s needs. This is followed by discussion of resourcing, accessibility, and use of health services, and more detailed discussion of HIV and AIDS and nutrition. Children and South Africa’s Education Budget (October 2016): This brief looks at education budgets. It first presents and describes a set of key indicators. It then describes the structure of provincial budgets and source of funds. This is followed by discussion on budgeting for the foundation years, teachers, teaching and learning support materials, Grade R, and infrastructure. Children and South Africa’s Social Development Budget (October 2016): This brief looks at social developments budgets. It first presents and describes a set of key indicators. It then discusses how much provinces allocate for children’s services, and budgeting for prevention and early intervention services, early child development services, non-profit organizations that deliver children’s services, and child grants. Children and the South African Budget: The Macro Picture (October 2016): This brief presents the macro picture of government budgets in South Africa. It first presents and describes a set of key indicators. It then describes how national, provincial and municipal budgets are funded, and the transfers between the three spheres. The brief then highlights what proportions the three key sectors – education, health and social assistance and welfare – constitute of the combined national and provincial budgets. Finally, there is a short description of the budget process. Children and the South African Budget: Key Messages (October 2016): This presentation outlines key messages related to children and South Africa’s budget. Estimating the Cost of Sanitation Infrastructure for Selected Sites in Khayelitsha in City of Cape Town (April 2016): In April 2016 the International Budget Partnership South Africa and the Social Justice Coalition (SJC) commissioned Cornerstone Economic Research to develop a model to cost sanitation upgrade scenarios for informal settlements across Cape Town. Submission to the National Assembly Standing Committee on Appropriations on the 2016 National Budget (March 2016): In February 2016, IBP South Africa and Code4SA launched Vote4theBudget.org, an online tool developed to give South African citizens the opportunity to easily tell parliament their thoughts about the 2016/17 National Budget. Over 200 people used the site to send individual submissions to the Secretary of the Appropriations Committee. Our March 2016 Submission to the National Assembly Standing Committee on Appropriations on the 2016 National Budget provides an overview of the development of Vote4theBudget.org and a summary of all citizen submissions. City of Cape Town Electricity Citizens Budget (April 2016): Electricity is one of the biggest parts of the City of Cape Town’s 2016/17 budget. IBP South Africa worked with the city’s electricity department to produce this citizens budget to help make the public participation process more meaningful. Public Monitoring of Government Food Security Services in South Africa: What Data Need to be Produced and Published? (February 2016): This note explores what information the South African government needs to publish to enable effective public monitoring of the delivery of food security through South Africa’s Social Relief of Distress (SRD) program. Monitoring Public Procurement in South Africa: A Reference Guide for Civil Society Organizations (December 2015): This guide presents civil society organizations and other interested readers with information and tools to help monitor public procurement. The assumption is that robust oversight over public procurement in South Africa will ultimately improve service delivery, reduce corruption, and strengthen public participation. A Guide to Conducting Social Audits in South Africa (November 2015): This guide is a collaboration between the Social Justice Coalition (SJC), Ndifuna Ukwazi (NU), and the International Budget Partnership. It aims to help community activists and organized civil society groups in South Africa think about, conduct, and reflect on social audits. Public Monitoring of School Infrastructure in South Africa: What Data Needs to be Produced and Published? (September 2015): This note explores what information needs to be published by government to enable the public to monitor the delivery of school infrastructure. Citizens Adjusted Budget (October 2014): IBP South Africa and the Budget Monitoring Expenditure Forum published this Citizens Adjustment Budget 2014/15 — an easy to use key to unlocking the government’s very technical Adjustments Budget.